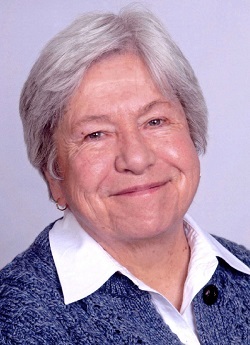 For Sister Mary Pat Naumes, this Jubilee brings profound gratitude. The perspective of 50 years transforms even difficult times and struggles into turning points and blessings. Being born to loving, wise parents is the first of many blessings. A great brother and sister, generous extended family, many friends, and the compassionate community of the Holy Names Sisters extends that foundational gift of nurture to this day. When Jesus sent out his disciples, he exhorted them to say: “The Reign of God (God’s power) is very near to you” (Luke 10:10). There were many blessings in the preparation necessary to deliver this message. Before entering, there were 12 years of Holy Names education at St. Mary’s, Medford, and two years at Dominican College, San Rafael, California. After entering came teacher training and art studies at Marylhurst College, theology at Mt. Angel Seminary, and psychology at Western Oregon State College. Years in ministry have offered opportunities to meet and work with different cultures and gifted colleagues, as well as people at vulnerable and important moments in their lives. Her first ministry was as a middle grade teacher at Holy Redeemer, Portland, and St. Francis, Bend. She then shifted to Religious Education Director and art teacher at Holy Family, Portland. Another shift came as Director of First Commitment Sisters and Formation Team member and working on art curriculum at several Catholic schools. Other confirming experiences came as Religious Education Director for three parishes in Walla Walla, Washington, and Queen of Peace, Salem. Coming full circle, she returned to the Rogue Valley, working at her alma mater St. Mary’s, Medford, as liturgist, Director of Community Service, and teacher.